unbelievably well in some situations. Here is the Cliff’s Notes version from Self’s comments at his press conference today. Full audio has been posted. • Oklahoma State’s Marcus Smart dominated the game physically. Not very often does a point guard score 25 points and make one shot outside of two feet, and that’s what he did. He just whipped KU going after the ball. KU did a great job on the offensive glass in the first half against a really good Oklahoma State defensive rebounding team. That faded in the second half. • It’s too early to tell if Oklahoma State is the second-best team in the Big 12. It has a lot of talent. OSU has played the toughest schedule in the conference so far. Athletically, the Cowboys have got some guys that can play. • Self has been on Johnson pretty good, because he hasn’t played as well as he can play. Self is not pleased with how he’s playing. Johnson’s not pleased either. 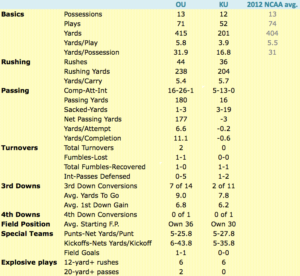 But most quarterbacks are judged by their record more than their stats. It should be that way with Johnson. Self says for KU to have any chance to compete at the highest level, it has to have its best players play the best. Johnson is one of KU’s best players. Self is going to ride Johnson. But that’s his guy. • Self knows what gives KU the best chance to win is not being emotional about what happened in a certain situation. Doing that might not be the best thing for the long term prospects of his team. • Self thinks when you worry about shooting, everything else goes haywire. When Johnson starts caring about, “I don’t care about my shooting percentage. What can I do to get our team the best shot?” he’ll be better off. Sometimes, Johnson puts too much pressure on himself to make shots. He needs to focus more on being a player and not just a shooter. Once he does that, he’ll make more shots. • Jeff Withey’s stats are fine. Self says lots of players played under their ceilings against OSU. Withey has done pretty well. It’s a long season, and it’s a physical season for a guy that has a lot of guys leaning on him. He’s done a great job, though. • Withey has pleasantly surprised Self more than anybody he’s had at KU. Withey is stronger, which brings confidence. The biggest thing with him is he’s fallen in love with basketball. Self thinks that has as much to do with his progress as anything. • Self joked there’s a chance he might mention the word “toughness” in practice today. Self is upset because he thought his team stood there and took it. KU allowed OSU to take the game. When things were going bad, KU’s body language wasn’t good. It was almost a mind-set that you might take for granted that other teams can beat you. Self thought his team looked like a spoiled team on Saturday. It’s not broken. It’s not panic time. But it is a wake-up call to fix some things. The Baltimore Ravens lost a lot of games this year, but they didn’t bench quarterback Joe Flacco. Losses are OK if you get better from them. Self says losing at home was good for his team. He would take a home loss over a road loss at this point, because it humbled his team more. • TCU will be competitive. Coach Trent Johnson is just in his first year. He’s building for the future. Johnson knows what he’s doing. It’s just a matter of time. Self thinks TCU is good for the league, as having a Big 12 team in Dallas is good for recruiting. Self hopes for a good KU turnout in Dallas. The Jayhawks will be happy to play again. • Does Andrew White III deserve to play more with his talent? Absolutely. But the need of the team is ballhandling and passing, and he doesn’t fit that need. Self said truthfully, if KU had better ballhandlers and passers, White would be playing more. KU has always played with multiple guards. It’s not doing that as much this year because the team needs Travis Releford and Ben McLemore on the floor at the same time.